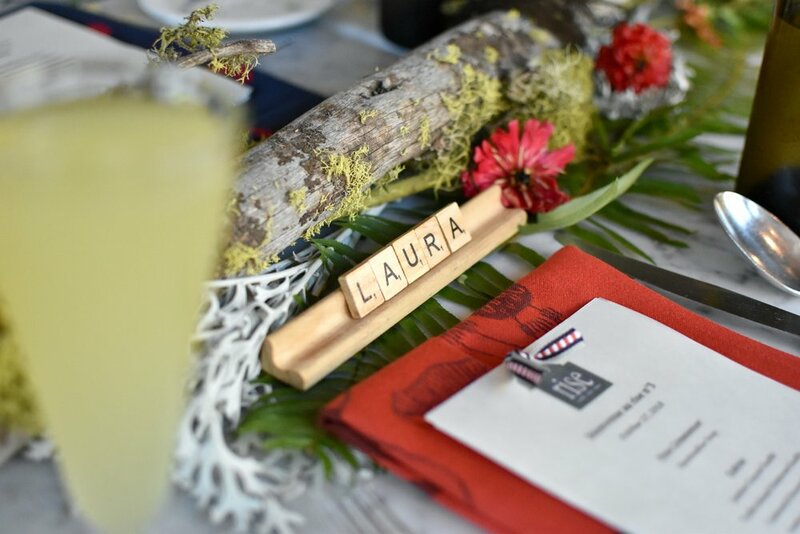 I recently was invited to attend a brunch at Rise to try out their menu and get to know the restaurant a little more. 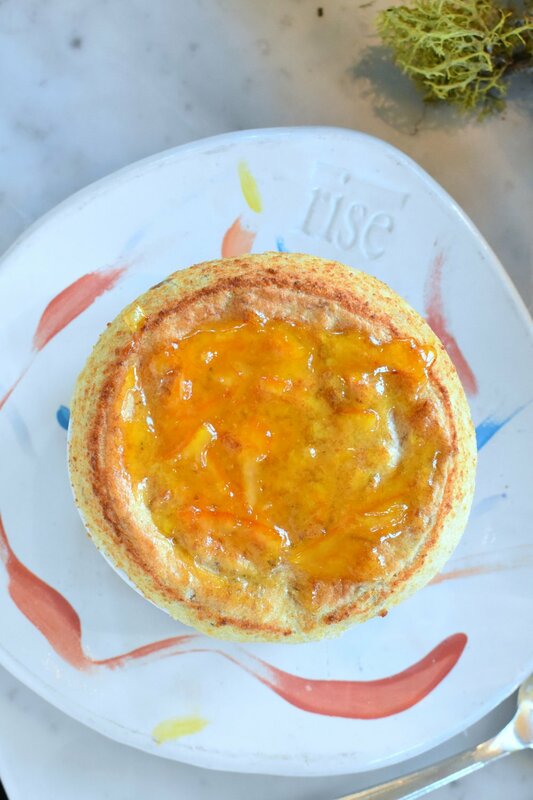 If you’re unfamiliar with Rise, it’s a fun spot here in Fort Worth that specializes in soufflés. It was a delight to be a part of this not just because of the great food! Rise has a noticeably different ambience than other hot spots around town. The dining experience usually lasts a minimum of around an hour and a half. Here, instead of getting the bill and feeling like the wait staff is ready for you to leave, you’re meant to sit back and enjoy, and, everything from the menu to the decor matches that sentiment. We were treated to a beautiful arrangement of foods, not limited to their signature soufflés. I tasted a bit from the main table and then enjoyed some of their classic Marshmallow Soup as a starter. 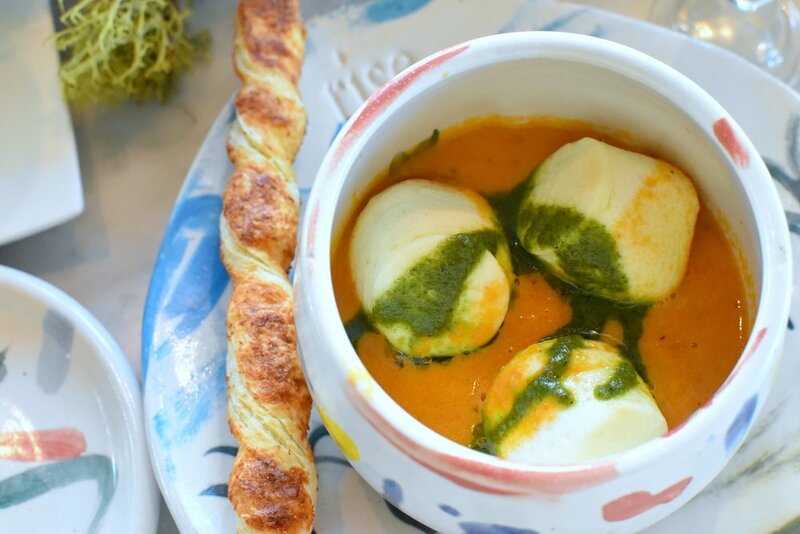 The soup is a tomato bisque with small goat cheese soufflés in it and topped with a zesty pesto sauce. It may seem like it’s a rainy-day type of treat but trust me, this works with any weather. For the entree, I chose the Duck a’lOrange soufflé which was a dream. I described it as “Thanksgiving in a bowl” and an absolute delight in regards to a savory soufflé. For dessert I went with the raspberry soufflé which again was perfect. Because it had a tart flavor and texture, it wasn’t heavy. It was the perfect addition to both the soup and the Duck a’lOrange. 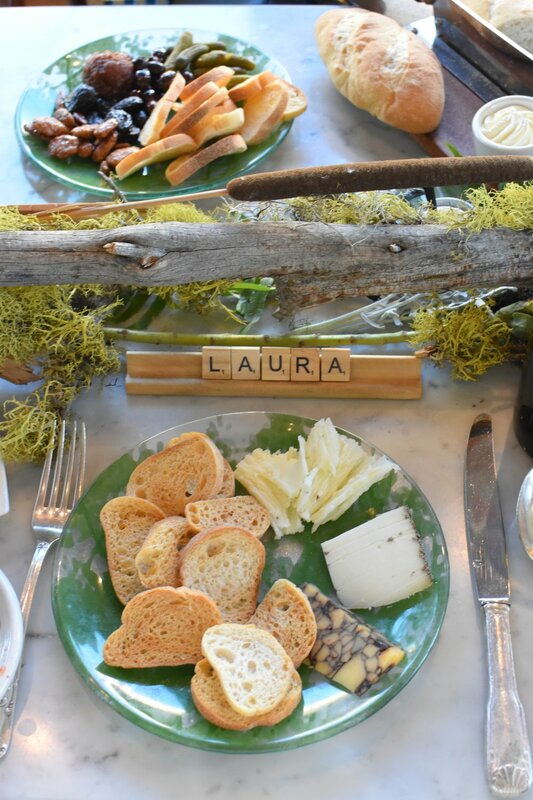 All of this was wonderful and I think it’s absolutely worth your time to stop by and try it, however, it was their cheese selection that left a lasting impression on me. Before the soup, we were brought a hefty cheese board holding 12 hand-selected cheeses from around the world and given a brief explanation about each of them. 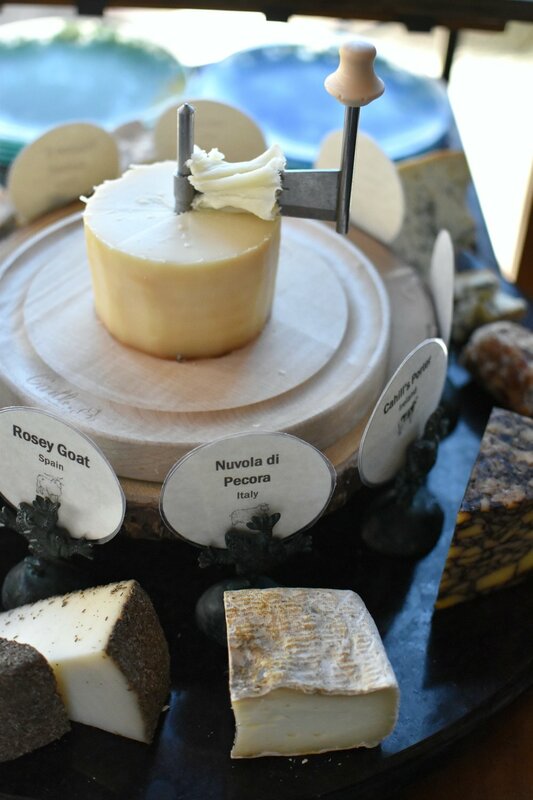 Two cheeses were featured on their signature girolle, which is a device to help shave the cheese. I went with the Rosey Goat, (Spain), Cahill’s Porter (Ireland), and Boschetto al Tartufo (Italy). They were all insanely good. I was pleased with my choices, but the Boschetto al Tartufo may be one of the best cheeses I’ve ever had. It’s a fresh, semi-soft cheese made from a combination of a cow's and sheep's milk and infused with shavings of rare white truffles. After we had enjoyed our cheese along with their tasty accompaniments, the cheese presenter casually mentioned that you can buy any of the cheeses here in the restaurant. This kind of floored me. I’m someone who strolls into high end stores and picks out cheese like most people do wine, by how pretty the label is compared with the price. Like wine, sometimes you nail it and find a favorite. Other times you’re less than impressed. This happens regularly with me and to be fair, I don’t seek out an employee nearby for answers or really expect them to have the knowledge to point me towards some great cheeses. I even asked as clearly as possible because I couldn’t really believe this option was available from Rise. “So, instead of heading into the super market or a similar option, I can just come here and buy these cheeses?” The answer is yes. You can come by the restaurant and get a brief explanation of the cheeses that are available and then purchase a couple to take home. If you’re looking for a full cheese board, they can even build it for you for pick up. Personally, I’m rarely someone who needs to have it made for me, but I almost always need some hand holding during the actual cheese selection. When family comes into town, for the upcoming holidays, or even just because, I now know that I can get a few quality options for a cheeseboard with very little effort. I had no idea that this service was available and whether it be for entertaining or simply a calm night in, I’m already figuring out when I can next stop by and bring home some of that Tartufo!